This year, The UK VC Partnerships Group working alongside JISC (UK) held their National Awards Ceremony from the Bett Show at the Excel Exhibition centre in London on Wednesday 25th January. 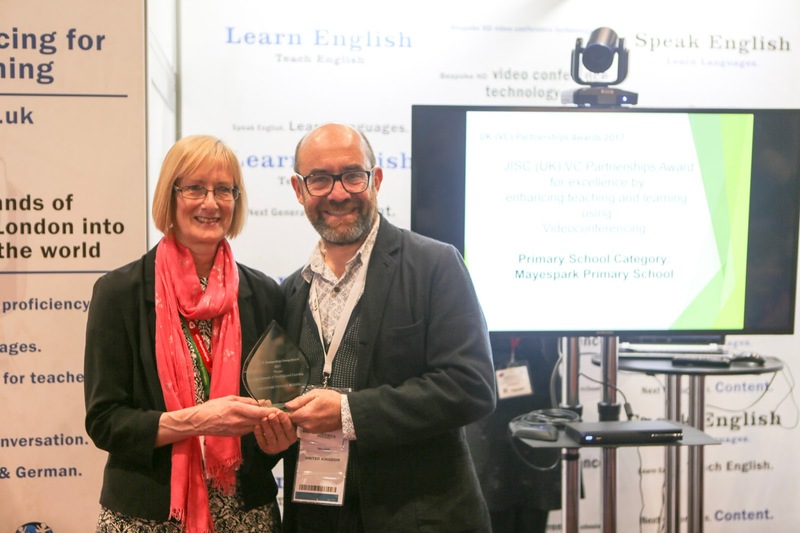 The winners from across the education sector showcased what they have done for teaching and learning using video conferencing to win their national accolade. Richard Sedding, Chair of the group, alongside other members from all over the UK joined the ceremony to see the winners awarded with their trophies from former minister for education, Lord Jim Knight,Chief education adviser for tes.com. This award submission showcases the expert visitors from Croatia, Australia, Sweden, Borneo, and New York who have connected with Mayespark to enrich our learning about other cultures, environments and develop new skills. We have invited in museums, authors, other schools, local councillors and inspirational speakers. Our VC strategy has enhanced our classroom practice across our whole school. As many opportunities give us experiences that we wouldn’t have access to, the real cost is unquantifiable. We meet international experts without leaving the school. Through the Redbridge VC Network we share video conferences, so experts are able to talk to several schools at once. (Estimated £ savings in making virtual visits: £5640; miles travelled 68,400). Video Conferences definitely enrich our children’s learning experiences! We have taken part in the following VCs during 2015-2016. Chris Lubbe 21st October –Black History Month. Chris has visited our school in the past so we were excited to see him again. All the children have been inspired by him and his story. We took the opportunity to sing to him – ‘Something inside so strong’. Little did we know that this was a song that inspired him during the apartheid struggles in South Africa. A very moving experience for us all. School Council – Meet Roger Evans, London Assembly – 11th November. Our school councillors met Roger Evans. A great opportunity for the school councillors to present their ideas. We are hoping to follow this up with a visit to City Hall. Manhattan School of Music – 7th December. The choir thoroughly enjoyed their opportunity to sing Christmas carols with the Manhattan School of Music. Dan Freedman 9th March. A chance for Year 5 to meet the author. Another great experience for the children to ask questions of an author. National Archives – Great Fire of London – March. Our Year 2 Spring Term topic was the Great Fire of London. This was the first time we had VC’d with the National Archives and we were really pleased with the content. A great role play and interactive experience for the children. The Orang Utan Protection Foundation – May. ‘Where will you find the wild things?’ is the Year 1 topic in the summer term. Class 1B joined the staff at the Orang Utan Protection Foundation in the jungle in Borneo, to find out about orang utans. Mammal of the skies – the grey headed flying fox – June. James MacDiarmid linked up from Australia to give Year 5 an insight into this interesting mammal, as part of their science topic. Heather Fell, Modern Pentathlete, who won silver at the 2008 Olympics – July. Year 6 talked with Heather about her experiences and what it takes to become an Olympic champion! Exploring fossils from over 11,000 years ago – July. We joined James MacDiarmid in a pit cave in northern Wyoming, USA, where he explained what fossils had been found from the Ice Age.